LOS ANGELES – October 7, 2010 — CBS Mobile and Chillingo, a leading downloadable games publisher, today announced the new mobile game based on the Emmy-nominated television series NUMB3RS is now available at the App Store. The game, now available for iPad, iPhone and iPod touch, lets fans continue their passion for the show and crime solving while taking on the role of a FBI consultant tasked to bring down a sinister, criminal network in Los Angeles. NUMB3RS premiered on the CBS Television Network in January 2005, and was the most popular show airing on Friday evenings among all broadcast networks that season, and again from 2007-2008 in total viewers. NUMB3RS currently airs in broadcast syndication on weekends. For station and time, check your local listings at www.numb3rsweekends.com. Developed by innovative indie game developer Apocalypse Train, the NUMB3RS game features a unique blend of action and logic as players face an array of mathematical puzzles and mini-games. 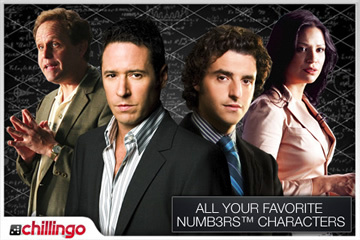 Popular NUMB3RS characters including Charlie Eppes, Don Eppes, Amita Ramanujan and Larry Fleinhardt interact with players for an immersive experience to solve one of the agency’s biggest cases. – Math-Based Gameplay: Step into the shoes of a math genius, where equations are your weapon. Solve equations quickly before they reach the “Error Zone” to locate criminals. – Multiple Difficulty Levels: Players can modify the settings (Easy, Normal and Genius Modes) to their preferences for a tailored game experience. – Chillingo’s social gaming platform, Crystal, allows players to compare scores and rankings via online leaderboards and achievements. The NUMB3RS game is now available for .99 cents from the App Store on iPhone, iPod touch and iPad, or at www.itunes.com/appstore/. CBS Mobile, a unit of CBS Interactive Inc., is charged with building CBS Corporation’s wireless business across entertainment, sports and news for CBS, The CW, and CBS Paramount Television. As part of this mission, CBS Mobile offers consumers some of the most innovative and best-of wireless content available today, ranging from the nation’s first mobile video alerts for CBS Mobile News, CBS Sports Mobile and entertainment properties, to some of the nation’s largest mobile Web sites, made-for-mobile video on all major carriers, a 24/7 mobile television network, and partnerships with the world’s more leading edge mobile technology and ad targeting companies. CBS Corporation is the parent company of CBS Interactive Inc.
Chillingo publishes innovative games and software for various platforms. Other hit iPhone, iPod touch and iPad titles include Angry Birds, Minigore, Helsing’s Fire, Ravensword: The Fallen King, Ice Age: Dawn of the Dinosaurs, iDracula and Cash Cow. For more information about Chillingo please visit chillingo.com. I am rewatching the number series. I guess cause charlie is a geek he does not realize that his girl was hot and should get busy with her. I have ordered the whole 6 series and I am watching it again on season 3. it has some good stuff. kids should watch it as it shows the use of math. too bad that they did not carry it on showing charlie and ametia having a child. what is the rest of the crew up too?